Stuffed Aloo Palak Paratha are made with spinach wholewheat dough stuffed with mildly spiced potato mixture. In a large stock pot, heat enough water and add the spinach leaves along with some salt. Allow them to blanch for 5-6 minutes. Drain the hot water from the spinach leaves and run them under cold tap water. Prepare the Potato filling mixture by mashing the cooked potatoes along with the rest of the ingredients. Check for seasoning and add more if needed. 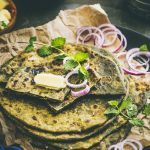 How to make Stuffed Aloo Paratha? Divide the dough into 10 equal portions. Pick one portion of dough at a time, dust some flour and spread them with the roller into thin disk of 5cm or so. Spread 1/2 a tsp of oil in the middle of the rolled dough, place the potato mixture right in the middle leaving space in the edges to seal. Starting right from the edge, begin pleating and seal the filling mixture with the dough. Dust some flour and roll the dough gently, ensuring the filling doesn't come out. Heat a non-stick pan / tava to a high temperature. Place the rolled Aloo Palak paratha on the tava and cook for a 1-1.5 minutes or so. When the base is cooked, flip the paratha and cook again. Spread a teaspoon of oil on part cooked paratha. Flip again and you will find the paratha cooked nicely with a couple of charred/black spots. Spread some more oil and you will find the paratha puffs up really well. You may even use spatula's to press the edges of the dough, just to ensure they cook well. Remove the cooked paratha's from the flame into a casserole and keep them covered. Repeat the process with the rest of the Aloo Palak Paratha. Once all the Aloo Palak Paratha are piled in the casserole, serve them hot with Onion Salad, Raita or plain yogurt and some pickle. If you would like to know how to make Spinach Roti's with the same dough - check out the post on how to flame bake them or cook them on a tava pan.